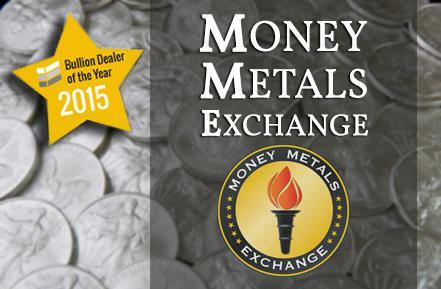 EAGLE, ID / ACCESSWIRE / February 4, 2015 / In balloting conducted over a two-month period ending on January 31, Money Metals Exchange topped a field of 422 eligible dealers in the United States. Ultimately, precious metals customers and industry insiders from across the globe cast 20,548 verified votes. "From [Money Metals'] regular news, analysis, and podcasts to their positive reviews across the web - it's consistent, it's regular, and no doubt for their competition, it's relentless," wrote U.K.-based Bullion.Directory in a press statement last night. "No big-name celebrities, no tricks, and no flashy bells and whistles – just consistently good advice, fair pricing, and proper customer service." "We're deeply honored to have achieved this distinction in such a highly competitive field," said Stefan Gleason, president of Money Metals Exchange. "While Money Metals is known for fair, transparent pricing and fast delivery of customer orders, we're especially proud of our helpful, no-pressure sales approach and significant educational efforts." "We believe it's vital that customers are kept fully apprised of breaking news impacting precious metals as well as the advantages and disadvantages of various products," continued Gleason. "Trust is everything in this business. That's why Money Metals absolutely refuses to make a quick buck by unloading so-called "rare" coins on unsuspecting customers like so many of our competitors unfortunately do. Instead, we encourage investors to acquire the most gold and silver for their money by investing in bullion coins, rounds, and bars priced near the metals' actual melt value." Rated "A" with the Better Business Bureau, Money Metals Exchange attained more than $110 million in sales in 2014 and conducted over 65,000 monthly savings plan, IRA, and standard transactions with its 35,000 mostly U.S. customers. Founded in 2010, the rapidly growing precious metals dealer has become known for its no-pressure, approach to dealing with customers, its "white glove" service of even the smallest and newest of precious metals investors, its significant educational content at www.MoneyMetals.com, and its willingness to expose the unscrupulous dealings of "rare" coin companies that routinely rip off investors and invite regulatory scrutiny upon the entire industry. Bullion.Directory's official announcement is published here: http://bullion.directory/bullion-dealer-of-the-year-2015/. Money Metals Exchange is secure, private, beginner-friendly, and strives to offer customers the most gold and silver for their money. Its services also include high-quality educational content, breaking news alerts, self-directed precious metals IRA accounts, secure storage, and monthly gold and silver savings plans. The company is not a trading exchange, does not use financial leverage, and deals strictly in the physical market on a "cash and carry basis." For more information, please visit https://www.moneymetals.com.